The Oregon Measure of Economic Activity fell to -1.03 from -0.66 in June (“zero” for this measure indicates the average growth rate over the 1990-present period). The less volatile moving-average measure declined to -0.46. While on the surface this may seem to indicate that Oregon’s economy slowed sharply, the July numbers were heavily influenced by an unusual drag from activity at the Port of Portland. This measure was negatively impacted by a labor dispute, which will also likely affect the August numbers as well. 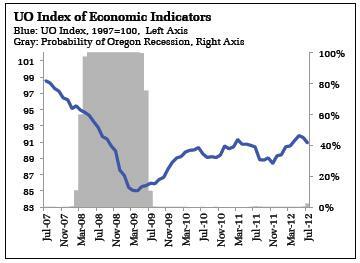 Thus, the decline should be interpreted as temporary and not indicative of a sharp change in the Oregon economy. After accounting for this temporary factor, the measure suggests Oregon is growing near its average growth rate of the last two decades. The University of Oregon Index of Economic Indicators™ fell 0.7 percent in July, extending June’s decline. Data flow this summer is showing some of the same softness seen in the past two summers; in neither case did that softness evolve into a recession. Moreover, the UO Index is 3.3 percent (annualized) higher over the past six months, an indication of continued growth. Residential building permits (smoothed with a five month-moving average) gained, rebounding from a decline in June, while the Oregon weight distance tax, a measure of trucking activity continued to hold steady. Initial unemployment claims rose, mimicking a summer uptick in national claims data. Nondefense, nonaircraft capital orders declined for the second month as slowing global growth continued to weigh on the manufacturing sector. Downside risks remain. Notably, the global economy remains under pressure from slowing activity in China and the impacts of the ongoing European economic crisis. Moreover, uncertainty about the path of fiscal policy in 2013 is not likely to be addressed until after the upcoming Presidential election. The baseline scenario remains steady but relatively slow growth for the national economy, with Oregon following a similar trajectory. How will economic issues shape the Presidential election? And what will the election mean for the economy in 2013 and beyond? With these questions in mind, we are pleased to announce the keynote speaker for this year’s Oregon Economic Forum will be noted economic policy expert and author Bruce Bartlett. In addition, University of Oregon economists Bruce McGough and Nicolas Sly will join us to give their insights on current economic events. 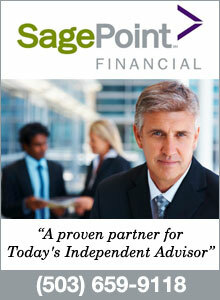 Forum Director Tim Duy will provide his annual economic review and preview for 2013. And, returning for a repeat performance, Brad DeLong, UC Berkeley Professor of Economics is now added to this year’s Oregon Economic Forum! Bruce Bartlett is a columnist for The Fiscal Times, an online newspaper covering public and personal finance, and Tax Notes, a weekly magazine for tax practitioners and policymakers. He also contributes a weekly post to the Economix blog at the New York Times, and writes regularly for the Financial Times. Bartlett was previously a columnist for Forbes magazine and Creators Syndicate. His writing often focuses on the intersection between politics and economics and attempts to inform politicians about economics, and economists about the current nature of politics. Bartlett’s work is informed by many years in government, including service on the staffs of Congressmen Ron Paul and Jack Kemp and Senator Roger Jepsen, as executive director of the Joint Economic Committee of Congress, senior policy analyst in the Reagan White House, and deputy assistant secretary for economic policy at the Treasury Department during the George H.W. Bush administration. Bruce is the author of seven books including the New York Times best-seller, Impostor: How George W. Bush Bankrupted America and Betrayed the Reagan Legacy (Doubleday, 2006). Special thanks to our presenting sponsor, KeyBank, our Silver sponsors, Providence Health Plans and the Portland Business Journal and our Bronze sponsors, Port of Portland, the Portland Business Alliance, and Langley.